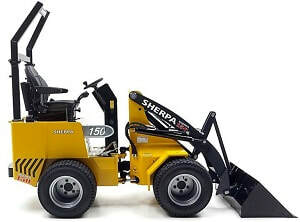 The Sherpa 150-mini loaders are the smallest professional mini loaders available on the market. Their compact narrow width of just 76 cm makes these mini loaders the perfect machines for gardeners and landscapers, who often must transport materials through very narrow gates and paths. Equipped with wide tyres for low ground pressure and added stability and power, the mini loaders will no damage underlying surfaces. With a strong Kubota diesel engine and handy attachments, the mini loaders are a smart choice. 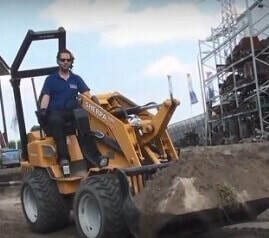 These mini loaders like our mini skid steer loaders are constructed from high-quality materials and are reliable and exceptionally efficient machines. The versatile, powerful Sherpa mini loaders are perfect for all terrains and favoured by the construction, farming, equestrian and gardening sectors for building roads, installing fences, riding arenas, working on large gardens and landscaping projects amongst other uses. The mini loaders have a powerful Kubota diesel engine, and because of their wider wheelbase and wide tyres, great stability and grip. When combining the mini loaders with our wide selection of quick changing mini loader attachments such as the mini loader buckets, these compact machines become even more functional. ​The 300 mini loaders are sturdy, robust and multi-functional machines. With a working capacity that exceeds expectations, these mini loaders will certainly reduce physical strain on the operator. These articulated mini loaders are excellent when paving, laying kerb-stones, mucking out stables and transporting many materials. The 300 STD mini loaders are equipped with special specifications such as: narrow tyres, 400-cc hydraulic engine, a 28-cc plunger pump, oil cooling, hydraulic handbrake and Parker (TM) hoses. These mini loaders have a dual-layer coating, which provides them with better protection against corrosion and minimises paint discolouration. Our most powerful mini loader from this range weighs 1.48 tons and is powered by a 25 kW/34-HP, 4-cylinder Kubota diesel engine. These strong but lightweight hydraulic 4-wheel-drive mini loaders can move up to 1,000 kilos. 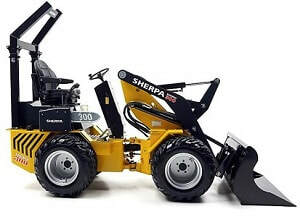 The 300 Plus mini loaders are the stars of the Sherpa 300 mini loader range. This mini loaders have a hydrostatic drive with a strong Kubota diesel engine that can safely lift and move a load of up to 1000 kg. With the very best hydraulics and drive technology, the reliability of these mini loaders is certainly guaranteed. The 300 plus mini loaders are ideally suited for working in the road construction, heavier gardening and agricultural projects. These mini loaders are equipped with wide tyres, a 365-cc hydraulic engine, a 34-cc plunger pump, oil cooling, a hydraulic handbrake and Parker(TM) hoses. Not having any additional transmissions such as clutches, differential gears or axle shafts makes these mini loaders less prone to wear and tear, reducing maintenance costs considerably. There is an option of equipping the 300 plus mini loader with a Kubota DF972 LPG engine if preferred. The 300 LPG mini loaders have all the features that makes the 300 series so successful and as an extra addition these 300 LPG mini loaders like their name indicates are equipped with a Kubota engine that functions on LPG for improved results and the advantage of minimal noise and exhaust fumes, making them invaluable in certain environments such as residential buildings, offices and stables. Whilst in the past certain jobs couldn't be carried out because of strict legislation, nowadays they can be done with these environmentally friendly loaders fast and efficiently. The level of performance of these LPG mini loaders is parallel to the 300 diesel engine models. A selection of mini loader attachments are available to complement these machines.